Flipkart and Amazon are structured differently. Sales of their legal entities cannot be compared. 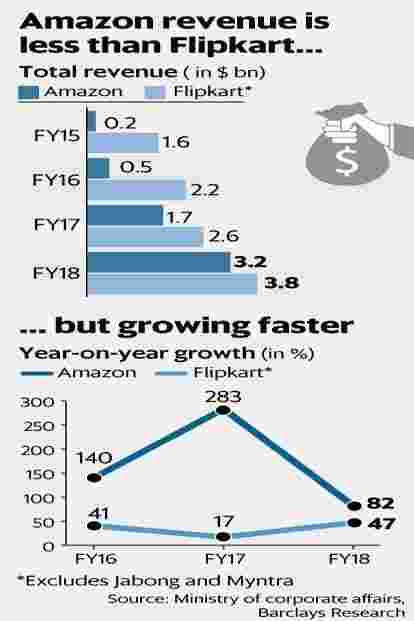 Bengaluru: Some analysts have questioned the methodology used by investment bank Barclays to conclude that Amazon India generated significantly higher sales than Flipkart in the last financial year, sparking a fresh debate about who dominates India’s $18 billion online retail market. If the Barclays report is accurate, then Walmart Inc., which agreed to buy a 77% stake in Flipkart for $16 billion in May, may have overpaid for the online retailer, other analysts said. In a report this week, Barclays said that Amazon recorded gross sales of $7.5 billion in the year ended 31 March 2018, compared with Flipkart’s gross sales of $6.2 billion in the same year. Flipkart’s numbers exclude those at Myntra and Jabong, its two fashion retail brands. While Barclays has relied partly on Walmart’s public disclosures about Flipkart’s sales, the financial services firm has based its Amazon estimates on “thousands of pages of local tax filings, (and) commentary from management". But the comparison between Flipkart’s and Amazon’s gross sales, as shown by Barclays, is questionable. For one, because of convoluted foreign investment rules in India, Flipkart and Amazon are structured in different ways so that sales of their legal entities cannot be compared directly. Barclays has made like-to-like comparisons between the B2B and B2C entities of Flipkart and Amazon, respectively, but these entities are not comparable partly as their commission rates and sales recognition techniques are different. Additionally, in Amazon’s case, one of the entities included by Barclays, is Amazon Pay, but the investment bank hasn’t included the numbers of PhonePe—the payments arm of Flipkart that is bigger than Amazon Pay. Amazon India chief Amit Agarwal said that the company was growing “faster than the landscape and faster than anybody else", without directly addressing the market leadership debate. “We are the most visited and most transacted marketplace in India. So, I’m not surprised that many other reports are recognizing the same impact," he said , without directly referring to the Barclays report. Flipkart said that it is “almost double" the size of Amazon. “Our work, especially in the last two years, suggests that Flipkart is way ahead both in terms of revenue and market share, and has showcased that progress in our marquee events, including the Big Billion Days," a Flipkart spokeswoman said. A Mint research, however, shows the two companies are running neck-and-neck and are exaggerating claims of clear market leadership in terms of gross sales.